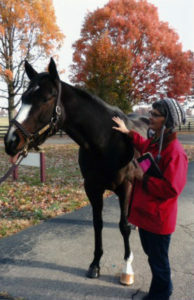 Rachel Alexandra’s story is a girl power story, even if this particular “girl” has four legs. In late 2009 Rachel Alexandra burst on the Thoroughbred racing scene, making headlines across the country. The fact that this muscular, sleek and athletic filly was beating all the male horses she raced against engaged the enthusiasm and imagination of many who were not typical racing enthusiasts. Young girls and their mothers, in particular, flocked to the track to cheer on their heroine as she challenged male horse after male horse and prevailed every time. But Rachel did not start out as a dominating diva. She was born to a small-time breeder in a little corner of the Kentucky bluegrass. Her mother rejected her and Rachel Alexandra had to be fed and raised by a wet nurse. Her breeder tried to sell her, but she had to be pulled from the sale because of a minor defect, easily fixed. Still, when she was sent to a training farm, the horsemen there saw something special. And they were right: when she got to the racetrack, she loved everything about it. She loved running. She loved her jockey, Calvin Borel, and she basked the adoration of her fans. Rachel retired in 2010 and had two offspring of her own: a colt named Jesse’s Dream and a filly named Rachel’s Valentina. Both her offspring raced during the 2015 season and were moderately successful. Jess’s Dream is now at stud in Ocala, FL. Rachel Alexandra now lives a relaxed life on Stonestreet Farm in Lexington, KY, where she enjoys romping in the fields and posing for photographs. Woodward: Only filly to win the Woodward. Even after winning the Woodward by a head and the Preakness by one length, her average margin of victory in 2009 was more than eight lengths.